This weekend, Amanda and I went to "Justice Day" in Escondido (She wrote a post about it too). 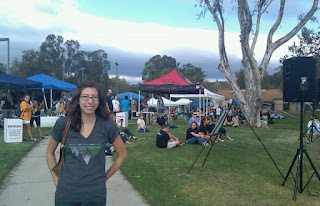 It was a sort of "justice fair" with booths featuring local fair trade and general justice organizations such as Breaking Chains, Cross Your Heart, Fill A Belly (one of my new favorite local organizations), Nika Water, Fair Trade Federation, and many more. There was live music & other festivities and in all, it was a wonderful celebration of awareness and justice. We really enjoyed ourselves even though we didn't have any money to spend (you can have fun without money, go figure). We discovered this event through the website of one of the vendors, ironically enough. Fair Trade San Diego is an organization which is "working to promote the awareness and use of fair trade in the San Diego region" and it's one of our new favorites. We plan on attending their Holiday Alternative Gift Fair in La Mesa next week since we're on the look out for creative ways of redeeming Christmas as "Good news to the poor" through gift-giving and presence-giving (check out Advent Conspiracy for other ideas). And you still wonder why you're in the UCC? LOL You're living authentically, my friend, and it's good to read about it. Ironically enough, most of the people running the event were from a local Calvary Chapel. But you're right... I do belong in the UCC. Stuff like this comes more naturally to them in any case.